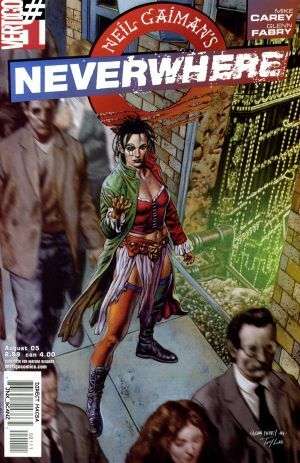 Neil Gaiman's Neverwhere Average 4.50/5 - out of 94 total votes. Richard Mayhew stumbles across Door, an extraordinary young lady from a London that Richard never dreamed could exist. A single act of kindness brings a pair of unthinkably ruthless assassins to his flat, and sends him on a quest that could quickly end with his own untimely demise. At the same time Richard Mayhew and his fiance, Jessica, are walking the streets of London, a noblewoman of "London Below" named Door is running for her life from assassins beneath the city. Injured and desperate, she seems to magically create a door to Richard's world and escapes through it. He finds her on the street, bleeding and slipping in and out of consciousness. Much to the chagrin of Jessica, Richard cancels their plans and brings Door back to his residence. The next morning, Door is miraculously healed, and the two assassins who'd been chasing her, Vandemar and Croup, show up to shake down Richard. Door manages to avoid detection, and then asks Richard for one final favor: to go find the Marquis de Carabas to help her.